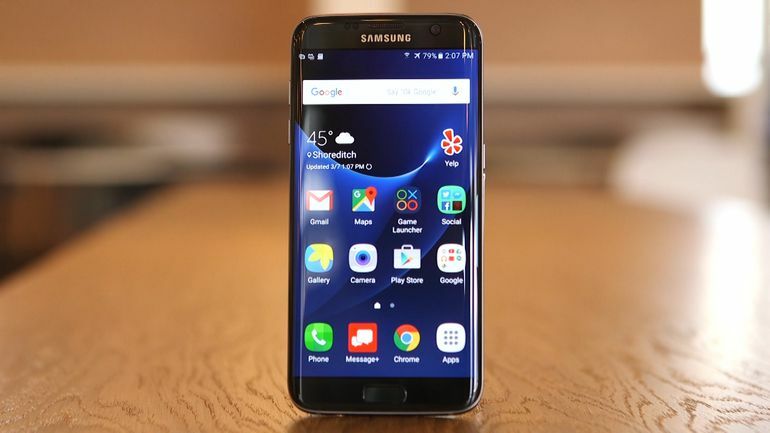 Android 7.0 Nougat update for the Galaxy S6 and Galaxy S6 edge seems to be delayed. The company’s UK subsidiary took to its Twitter account to reveal the reason behind the delay. According to the tweet, the update is postponed due a to quality review. 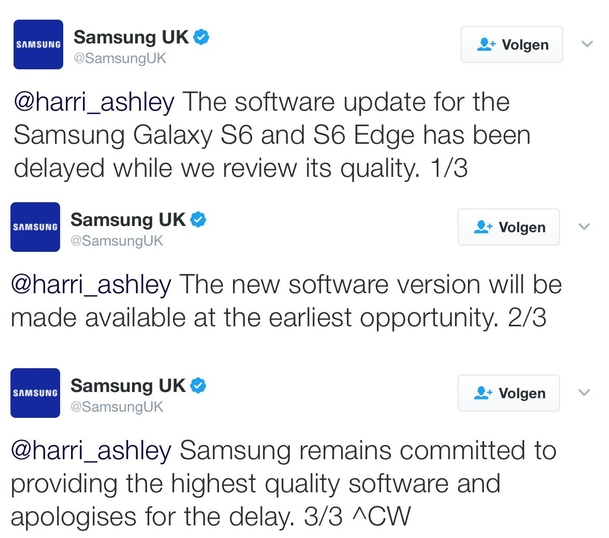 In the tweet, the company did not reveal other details such as the expected roll out date for the update. It only stated that the update would be made available at the earliest. The only good thing here is that now we know that Samsung is working on the upgrade, so the Galaxy S6 and Galaxy S6 edge users will soon get Nougat treat on their device. Regarding the Galaxy S7 and Galaxy S7 edge, Verizon has finally started rolling out the Nougat update for both the phones in the US. It is worth mentioning that Verizon is the last carrier to have rolled out the update to the S7 and S7 edge. There is also a security patch that comes with the update, but the patch’s month has not been mentioned in the log. The update brings the regular Nougat feature onboard, such as multi-window support, performance improvements, Grace UI, and lot more. This time around, Verizon finally let go of its go90 app with the latest update, and it has gone for good. If you have Verizon’s Galaxy S7 or S7 edge, then you got to check your phone for the update notification. You can also check for it manually by heading to Settings > About Phone > check for update. Make sure that your device is on a stable and fast internet connection while downloading the update. In another news, LG announced that it would soon roll out the Nougat update for its LG V10 and LG G4 devices. Lately, there have been a lot of confusion about the Nougat update for the LG G4 and V10, but today the company cleared the mess and revealed the timeline for the update. In an interview with Korea Times, LG’s official said that LG V10 would receive the update in the second quarter (somewhere between March to May), while the LG G4 will get it in the third quarter of 2017 (between June to August). It means that the company will also be extending the update to other regions outside Korea. Earlier, the rumours shot up in Korea stating that LG might not roll out the Nougat update for the G4 and V10 smartphones as both the phones are around two years old. The news did not go well with the users who bashed LG on the forums, comparing it with LG’s Nexus 5X that houses the same SoC as the V10 and G4. All the backlash seemed to have reversed LG’s decision, and now the company will finally extend the update to both the devices. Motorola also recently revealed that it will soon be rolling out the Nougat update for the Moto G4 and Moto G4 Plus. The company has already started running the soak test for the devices, which means that the update should debut by the end of this month. It will change the build number to NPJ25.93-13. However, Motorola has not revealed whether it will roll out the update to Moto G4 Play as well. 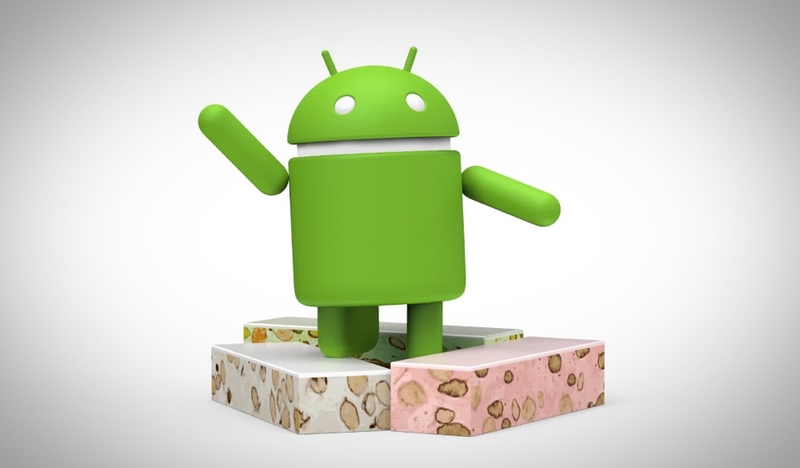 Stay tuned with us for more information on the Nougat update.